If there’s two things I love, it’s ice cream and cookies. Put them together into a cake and I’m one happy girl. 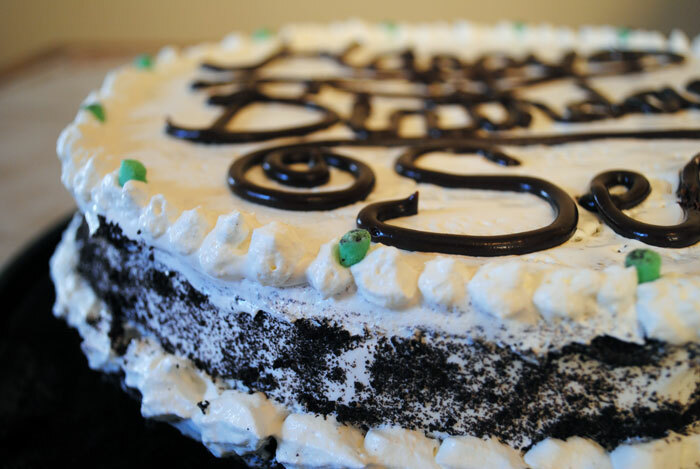 Instead of a traditional cake, Sean requested an ice cream cake for his birthday a few weeks ago. I gave him the option of choosing the 2 flavors of ice cream that would be used in it, and he went with Cookies & Cream and Mint Chocolate Chip. Great combo, if you ask me. 1. 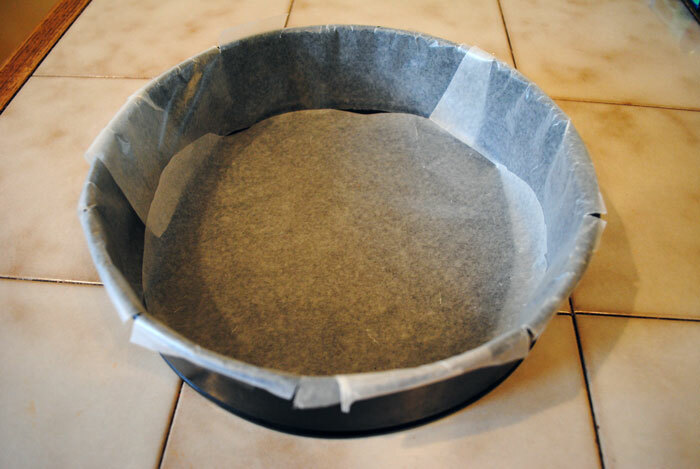 Start by lining your cheesecake pan with wax paper. This will make your life a MILLION times easier once you get to the last few steps of this cake. Trust me, wax paper is your friend. I simply traced the bottom of the cheesecake pan onto the wax paper and cut it, and stuck it down on the bottom. The sides were a bit trickier to do, but long strips along the edges seemed to get the job done. 2. 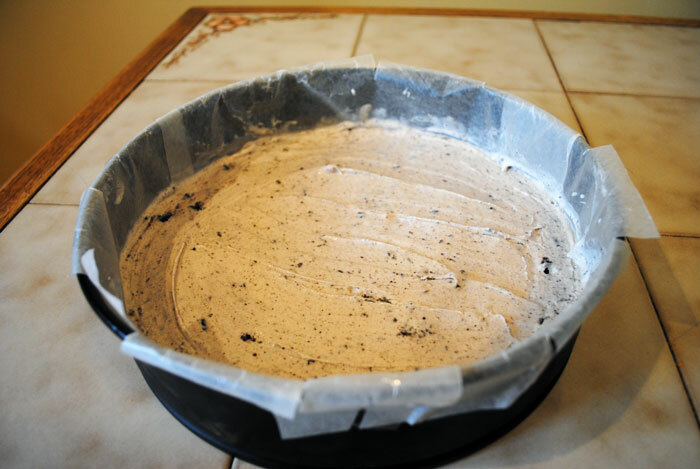 With partially softened ice cream, scoop your first ice cream flavor into the cheesecake pan. *NOTE: This will be the flavor on the TOP of your ice cream cake. The final frozen product will be flipped upside down. I went with Cookies & Cream first. With a rubber spatula, spread the softened ice cream into a smooth surface. Be sure to cover fill all the gaps in the bottom of the pan. Then, throw that thing in the freezer! You’ll have to wait until it’s completely frozen solid to continue with the next step. 3. Throw about 10 or 15 of the Oreos into a gallon ziplock bag. Make sure it’s sealed and SMASH AWAY. I used a meat tenderizer, but a rolling pin or another kitchen tool of your choice will work. This is the fun part, but don’t get too carried away. You want your cookie chunks to stay a bit chunky, and not get too finely crushed. 4. Mix your cookie chunks with a bit of hot fudge. This is going to act as a glue to make your cookie crumbles stick together. 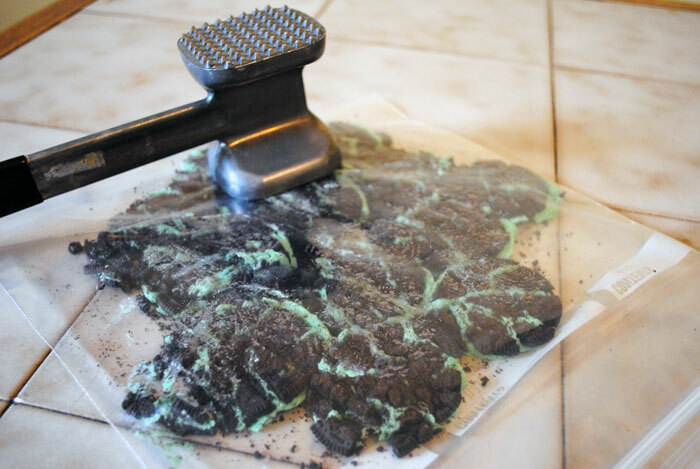 Spread your delicious cookie crumble onto the frozen layer of ice cream. Make sure you have enough mixture to cover all of the first ice cream layer. You’ll want the cookie crumble layer in every bite of this cake. 5. 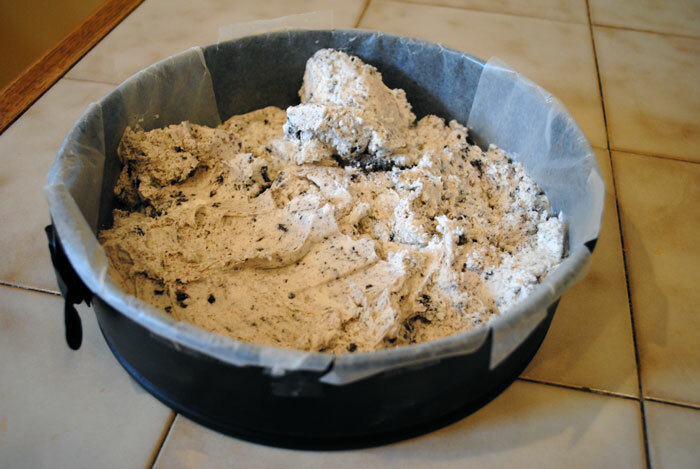 Just as step 2, take your 2nd flavor of softened ice cream and spread it on top of the cookie crumble layer. 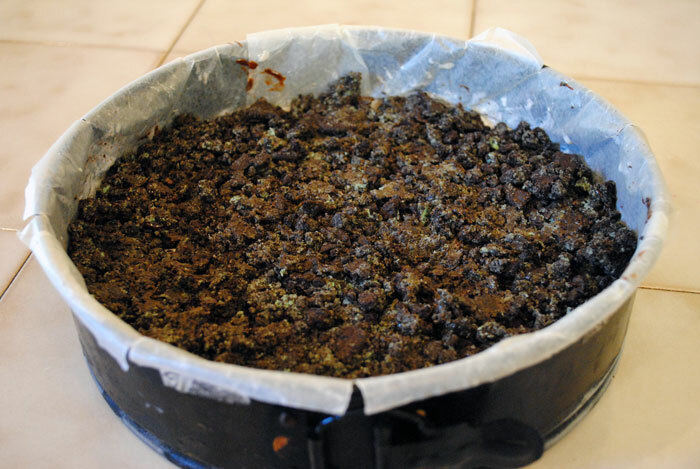 (Remember, this will be the bottom layer of your cake.) 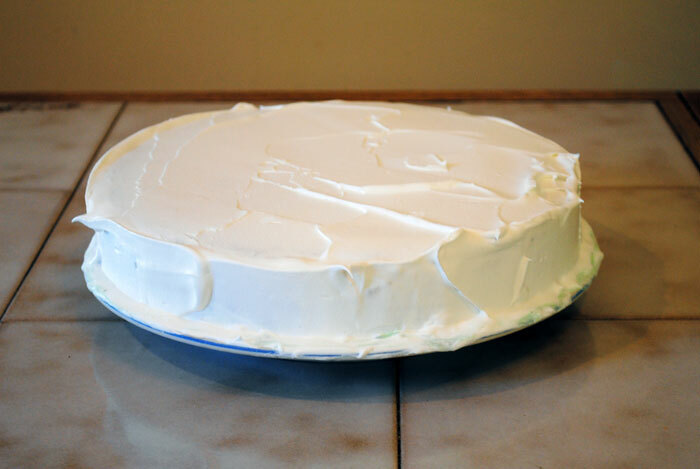 Try to spread it evenly so your cake won’t be lopsided when you flip it over. Then, FREEZE, FREEZE, FREEZE! You’ll want it to be completely rock solid before you try to move on to the next step because it WILL start to melt as you work with it. The quicker you work, the better. 6. 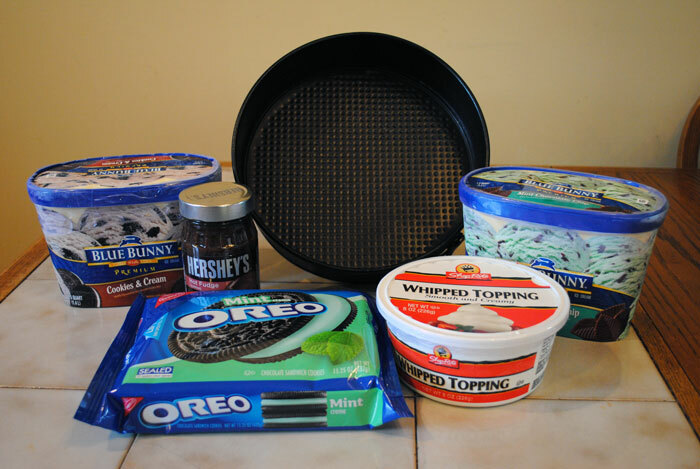 Take apart the cheesecake pan and pop your ice cream cake out of it. Flip it upside down onto a flat surface or plate and remove all of the wax paper. *Remember to work fast! This cake took me twice as long since I snapped pictures of it, but trust me, this thing was melting and sliding all over the place when I took too long to finish each step. If your cake looks like it’s melting too much, just throw it back in the freezer for another hour or so to stay on the safe side before resuming. 7. 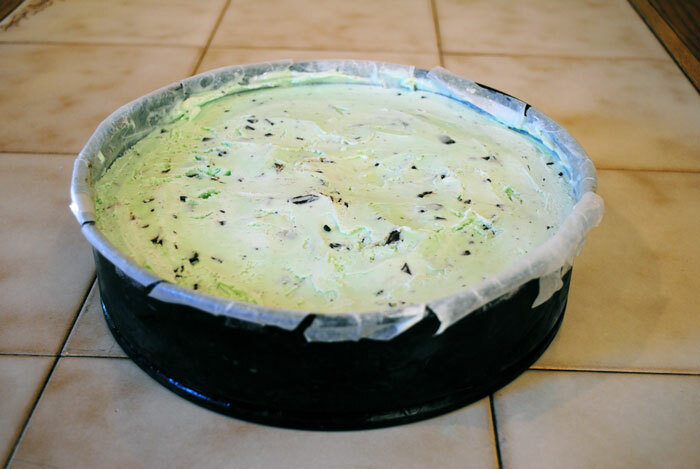 Cover the top and sides of your ice cream cake with spreadable whipped cream. Make sure you cover all of the exposed ice cream, because once the whipped cream freezes, it will lock in the ice cream and prevent it from leaking out the bottom. Throw it back in the freezer until it is solid. 8. Repeat process 1-2 times, being sure to freeze in between each layer. I found that it was easier to get a perfectly smooth finish by running an spatula across the top of the final frozen whipped cream layer. 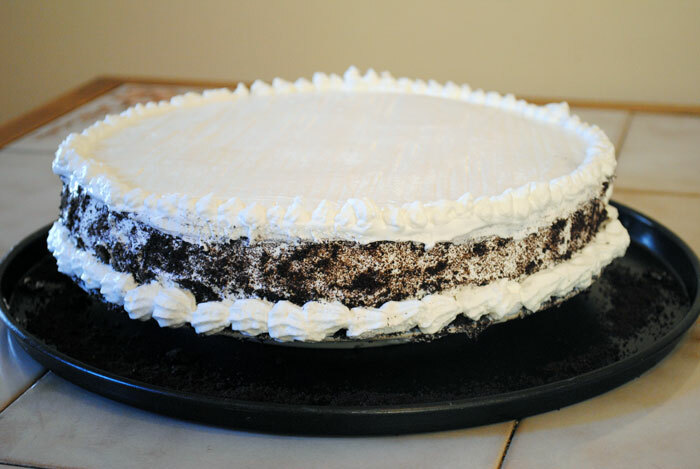 Here, I attempted to decorate the cake by spreading a thin layer of whipped cream on the edges and throwing a fine powder of crushed Oreos across the edge to stick to it. Sprinkles would also work here. It got a little messy, but I’m okay with the result. Then, with a piping bag and a star tip, I piped some lopsided whipped cream around the edges. Again, I was working as fast as I could to prevent any melting catastrophes. 9. Fill a piping bag (or ziplock with corner cut out) with hot fudge. Squish it around in your hands a bit to loosen it up. Then decorate the top of your cake however you choose. It was Sean’s birthday, so I played around with the Y’s in “happy” and “birthday” to make it interesting. If you’re not confident in your piping/lettering skills, try sketching it out on a piece of paper first. If you want, sometimes it is beneficial to trace out your letters in the whipped topping with a toothpick before you dedicate to the hot fudge. You can see my original toothpick lines in between the hot fudge. 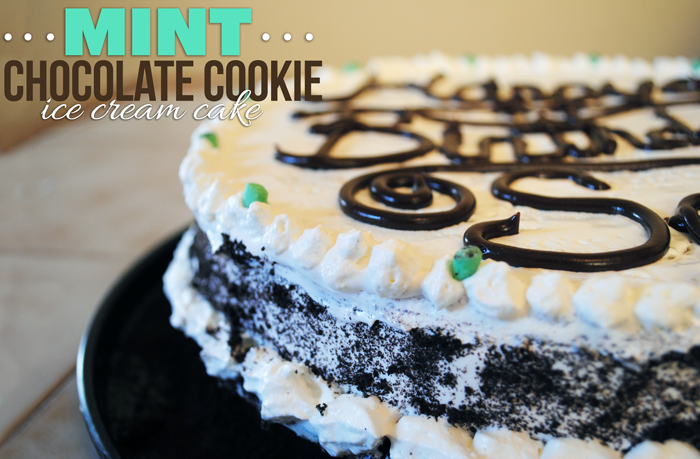 The little green balls are just bits of the mint Oreo filling to add a pop of color. Freeze your final product and keep covered until ready to be served. 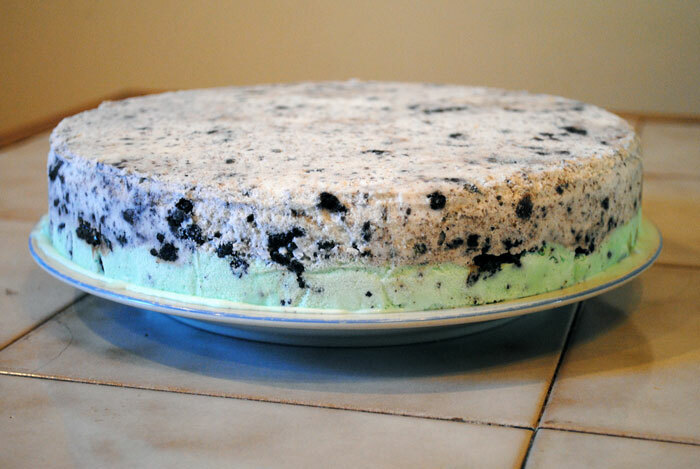 Overall, I’m really satisfied with the result of this ice cream cake. 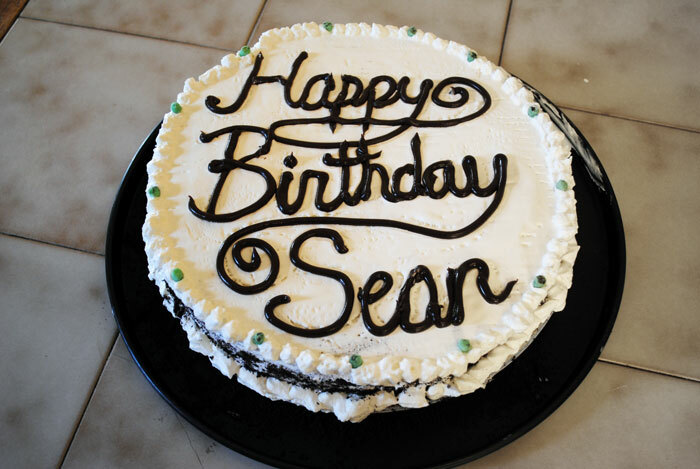 Truth be told: Some of Sean’s friends thought I purchased the cake! They said it looked and tasted that good. I know it could have reached that potential if I actually knew what I was doing and didn’t waste as much time letting it melt in between. But I’ll have to agree with them on the taste. This cake tasted as good, if not better than a store bought one. Go ahead and grab a spoon. You’re never too old for ice cream! Thanks Greg! I’ve always been a fan of cake decorating, so this was just one attempt at it. Have fun with the recipe.